The 1920 King's fire. The 1921 Carnegie report on Maritime education. A Maritime federated university. 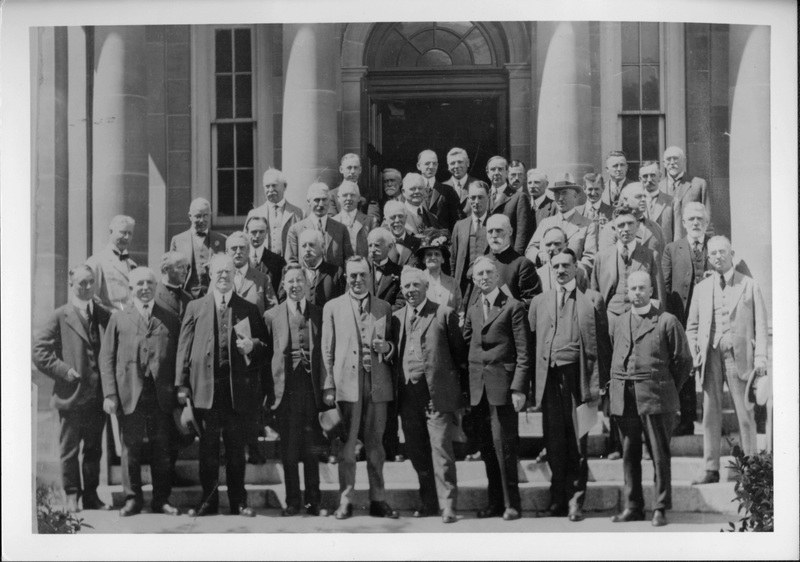 First federation meetings, July 1922. The October 1922 conference. Acadia withdraws, February 1923. King's joins Dalhousie, 1 September 1923. Mount Allison postpones federation. Central Advisory Committee and Memorial College, Newfoundland, 1924-5. Carnegie grant to Dalhousie, 1925. Some concluding reflections. "Arthur Stanley MacKenzie, Dalhousie’s widower president, had two great loves: his daughter and his university. Marjorie, a graduate of Bryn Mawr, was twenty-six years old in 1922 and occasionally acted as unofficial Dalhousie hostess. MacKenzie had never returned to active physics research after 1911; Dalhousie was too poor to afford much equipment, and his replacement in physics, Howard Bronson, had come to Dalhousie knowing that, and had become a teacher more than a researcher. MacKenzie could have escaped Dalhousie gracefully; in October 1920 the National Research Council invited him to be its chairman. But he was not much drawn to the offer; the question with MacKenzie was whether his going was good or bad for Dalhousie. Dalhousie was at a stage where he seemed to be the only one who saw its final shape, and the stages by which that could be reached. So he stayed. Methusaleh ate what he found on his plate, And never, as people do now, Did he note the amount of the calorie count, He ate it because it was chow. He was never disturbed, when at dinner he sat, Destroying a roast or a pie, By the thought it was lacking in granular fat, Or a couple of vitamins shy. He cheerfully chewed every species of food, Untroubled by worries or fears Lest his health should be hurt by some fancy dessert, And he lived over nine hundred years. "MacKenzie could use that light-hearted counsel. It was not just Dalhousie; the campus was busier and more filled with students than ever, and those big new numbers produced problems. But it was university federation that had come to preoccupy him."